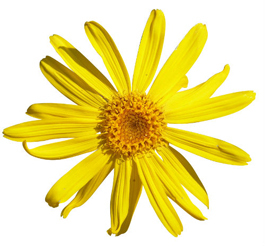 Arnica is an aromatic herb with a golden yellow daisy-like flower. Botanically it is known for being an antiseptic, astringent, antimicrobial, anti-inflammatory, anticoagulant, circulation stimulating and has healing properties. Arnica is also used to treat damaged, reddened and tired skin. Arnica is used in herbal medicine. Arnica montana is endemic to Europe, from southern Iberia to southern Scandinavia and the Carpathians. It is absent from the British Isles and the Italian and Balkan Peninsulas. A. montana grows in nutrient-poor siliceous meadows up to nearly 3,000 metres (9,800 ft). It is rare overall, but may be locally abundant. It is becoming rarer, particularly in the north of its distribution, largely due to increasingly intensive agriculture. In more upland regions, it may also be found on nutrient-poor moors and heaths.